This the half-way point of my Christmas beer posts. I'd be remiss if I didn't tell you that I've seen Bell's' Christmas Ale in stores before. I've seen it plenty of times. It's just never appealed to me. It features a Christmas tree standing alone in a field of grain. That's never exactly struck me as Christmasy. Until now, that is. I would never in a million years be able to tell you why I'm ready to try Bell's' yuletide offering this year. I just am. Let's hope that that readiness works out for me. Long-time readers (which I'm sure I don't have, because I've been doing this blog schtick for less than a year, but I know I have a few faithful readers [thank you!]) will know that I've recapped Bell's Brewing's history before. Here's the gist: Larry Bell opened a homebrew supply store in 1983. In '85 he got the idea to start selling some of the beer he'd been brewing. Now, his brand is behind some of the most highly-acclaimed brews to come out of Michigan. There may be a reason why this Christmas Ale has never struck me as Christmasy--according to it's official page, it is decidedly not spiced. 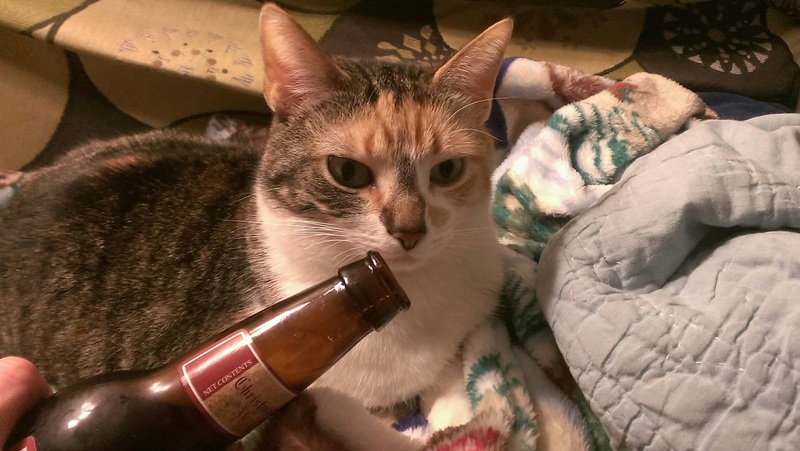 Some of my favorite beers, Christmas beers, are spiced. The page promises flavor (dryness, toastiness, toffeeness), which comes from the ale's locally-grown and specially-malted barley. Even though it's not spiced, Christmas Ale smells similar to other Christmas brews; which is to say, spicy. There's a sweetness lurking around behind that Christmas-time beer aroma. It doesn't overwhelm the ale. It actually mingles expertly. Also, Purrl loves how this smells, so don't let the embedded picture fool you into thinking otherwise. She gave it twelve whiffs. Twelve! That sweetness really carries through into the flavor. It's much more honey than toffee, although the toffee is present. The honey isn't overpowering like it is in a certain, other Christmas Ale, however. It actually accents the roastiness of the brew. It's expertly crafted. Christmas Ale has a full, chewy mouthfeel. Definitely an ale. When I was a kid, I spent a lot of my time during the holidays in a car. The majority of my extended family lived/still lives in Michigan. My immediate family (myself included) lived/still lives in Ohio. So, every year without fail, we'd pack up the car on December 26th and drive to a relative's house. We'd have a "Christmas" there then drive to another relative's house for another "Christmas." After two or three of these "Christmas"es (which were just present swapping and family time) we'd drive home. The whole thing took a good couple days. I saw a lot of the snow-covered Michigan countryside as a kid. Bell's would be happy, because me picturing that countryside, as I'm doing now, seems to be precisely what the brewery was going for with this ale. 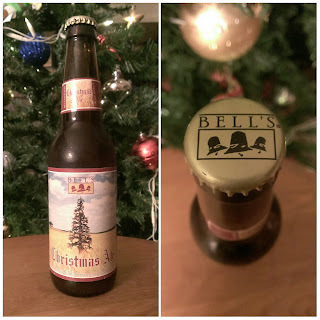 Bell's Brewing, Inc.'s Christmas Ale (which clocks in at 5.5% ABV) is a damn good Christmas beer. It doesn't have all the spices that I typically look forward to experiencing in a Christmas brew, but it doesn't need them. I'm giving it a 9.0/10. Treat yourself to it if you can find it.